It’s the same thing every year, plan for dry weather and hope for rain. Moisture is what farmers and ranchers out west are hoping for right now. 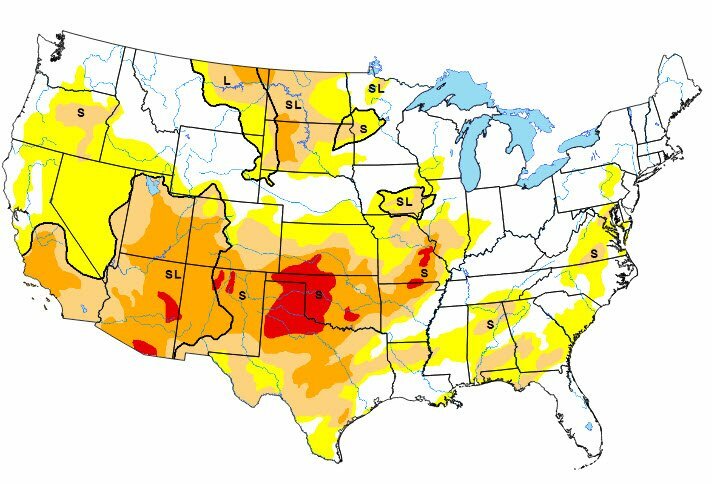 Drought is continuing to wreak havoc in the Southern Great Plains especially for Oklahoma, Texas, Kansas, and Arizona. More than 70% of the region from Texas to Kansas is in at least moderate drought according to the U.S. Drought Monitor map (shown below). That is why it’s best to have a drought management plan in place. The snow that most states out west were depending on isn’t showing up as much as it did in previous years. Parts of South Dakota have experienced a snow drought with 17” below average for the season. In Amarillo, Texas they are going on 121 consecutive days without measurable rain. The Noble Research Institute has provided a set of guidelines for developing a drought management plan for farmers and ranchers to be a step ahead of the game. 1. Know your expected forage production and annual rainfall patterns by season. As a rule of thumb for warm-season perennial pastures (native or introduced), about 70 percent of our annual forage production will occur by July 1 regardless of the total rainfall for our warm-season grasses occurs during the second quarter of the year (April through June), which is typically the most abundant rainfall quarter across the Southern Great Plains. If precipitation is below average for more than one quarter, drought management plans should be implemented. 2. Establish conservative stocking rates based on average (or below) moisture conditions, providing an element of flexibility into the stocking rate. For example, with a spring-calving cow-calving operation, maintain cattle inventory at about 70 percent of potential stocking rate with the plan to retain ownership of all or some calves through the following spring if moisture conditions are average or better. 3. Identify target dates to assess pasture conditions and make strategic decisions to keep the operation aligned with the long-term management plan. The most critical date during the growing season is the end of the second quarter when 70 percent of our forage production should have occurred. At this time, determine production to date and the variance from what was planned or expected. Another critical date is the end of the third quarter when forage reserves for the winter should be determined. 4. Apply spring fertilizer and herbicides to the most productive introduced grass pastures at the appropriate times. Even if early spring rains are absent, prepare to have fertilizer applied in early May since peak spring rainfall in the Southern Great Plains occurs in May and June. 5. Wean calves early. It is typically more cost effective to feed early-weaned calves through a drought than lactating cows. In addition, the maintenance requirements of a dry cow are about half that of a lactating cow. 6. If purchasing hay, purchase early in the growing season and only enough for winter us. Do not attempt to feed through a drought. According to NOAA, the drought outlook for the upcoming next three months doesn’t show a lot of promise for the southern states as drought continues to worsen. That is why drought management is crucial for an operation at this time. There are no easy answers when it comes to dealing with drought. However, with a good drought management plan in place, a producer is better prepared to take action if drought conditions persist.